Plants moderately pubescent distally, becoming glabrescent at maturity. Stems erect, usually green, moderately branched, rarely nearly simple, 0.5-1.5(-2.5) m. Leaves: petiole shorter than to equaling blade; blade rhombic-ovate, ovate, or elliptic to broadly lanceolate, 5-15(-20) × 2-10 cm, base cuneate, margins entire, apex acute to subobtuse, with mucro. Inflorescences terminal, drooping or nodding, usually red, purple, or white, less commonly green, silvery green, or yellow, usually much-branched at base, leafless at least distally, very large and robust. Bracts narrowly lanceolate to linear, equaling or subequal to tepals, not exceeding style branches, apex acuminate with excurrent midrib. Pistillate flowers: tepals 5, spatulate-obovate or lanceolate-obovate, not clawed, subequal, (1-)1.5-2(-2.5) mm, membranaceous, apex obtuse, slightly emarginate, or subacute with mucro; style branches spreading or reflexed; stigmas 3. Staminate flowers mostly at tips of inflorescences; tepals (4-)5; stamens 5. Utricles broadly ovoid to subglobose, 1.5-2(-2.5) mm, ± equaling tepals, dehiscence regularly circumscissile. Seeds dark brown to brownish black or reddish brown, yellowish white, or ivory, lenticular to subglobose, 1-1.2(-1.5) mm diam., smooth or indistinctly punctate. Flowering summer-fall. Rarely occurs as escapes, persisting near the places of cultivation; introduced; Calif., Conn., Del., Ill., Kans., Maine, Mass., Mich., Mo., N.Y., Oreg., Pa., Tenn., Vt., Wis.; Central America; South America; cultivated elsewhere except cold-temperate, subarctic, and arctic zones. 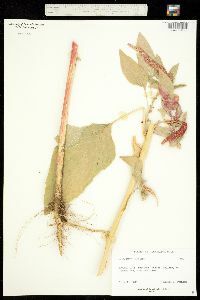 While reported as naturalized in some states, most specimens identified as Amaranthus caudatus are referable to A. hybridus or other native species. 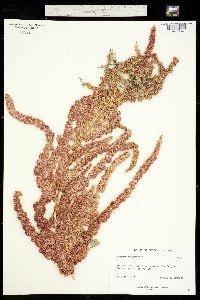 Amaranthus caudatus is one of the most popular domesticated amaranths and is cultivated primarily as an ornamental, and, to a lesser degree, as a pseudocereal. Plants of A. caudatus may occur locally, usually close to places of cultivation and mostly in the southern regions of the flora. No reliable records of their successful naturalization are available. It is impossible at present to trace records of such ephemeral populations and individual escapes; maps and detailed distribution statements for cultivated species of amaranths are not presented here. The origin of Amaranthus caudatus remains uncertain. It is generally believed that it originated in South America or Central America from some unspecified wild race of the A. hybridus aggregate, probably South American A. quitensis Kunth. At least some cultivated forms and strains of A. caudatus probably developed with some degree of hybridization with other cultivated species. Numerous infraspecific entities that are mostly of horticultural importance have been described within A. caudatus. Forms with erect and robust club-shaped inflorescences have been recognized as A. mantegazzianus. Cult. ornamental and grain-amaranth, apparently derived from the S. Amer. A. quitensis Kunth; monoecious, stout, erect, to 2 m; lvs long-petioled, elliptic to rhombic-ovate, to 2 dm; infl large and showy, generally bright red in life, composed of several to many drooping, spike-like thyrses, the terminal one 1-3 dm, much longer than the lateral; bract of the pistillate fls with slender midrib, not surpassing the fr; sep 5, outcurved above, the inner spatulate and obtuse or emarginate, all over 2 mm and nearly equaling the fr; style-branches slender, spreading from the base; seed most commonly pale ivory, and when fresh flushed with red around the rim, less commonly dark brown; 2n=32, 34. Amer. cultigen, originally cult. for grain, now relictual as a grain-plant, but widely cult. as an ornamental, occasionally escaping or persistent, but scarcely established in our range.